And Now Something For The Boys........Get Ready For Summer! 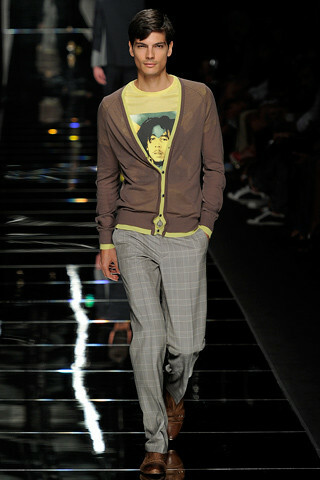 Gentlemen, here is your definitive guide to key pieces and trends for spring summer 2012. 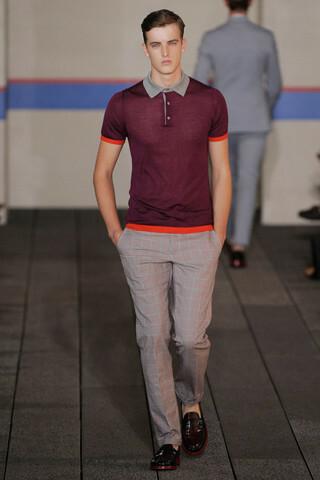 Men's trends for the coming season are rich in style, colour and texture. The menswear designers drew inspiration from various sources, like school uniforms, safety wear, tropical beaches and aristocratic preppiness. The key to the look is the essential layering which will make a statement whilst being laid back and cool. 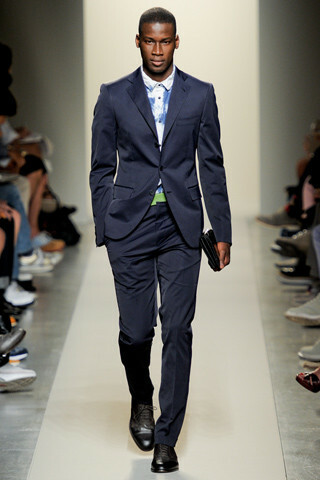 Blue was the predominant colour on the runway this season and worn head to toe in suits and casualwear. 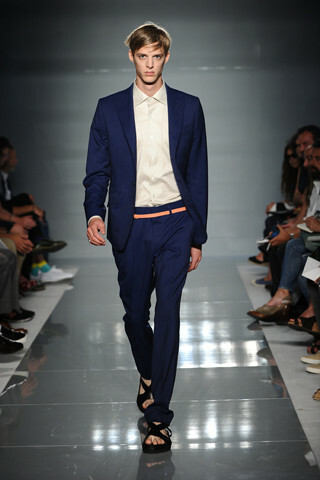 Key pieces include the single breasted, tonic (shiny fabric), slim fit suit in a rich blue (shown below by Bottega Venetta and Ports 1961, click an image to view gallery) – great for a wedding or smart dinner and is sure to make a statement. 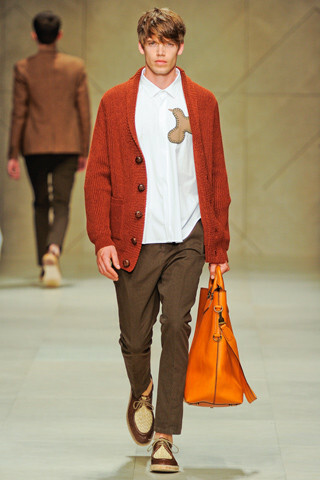 Accessorise with a tan belt and tan brogues. 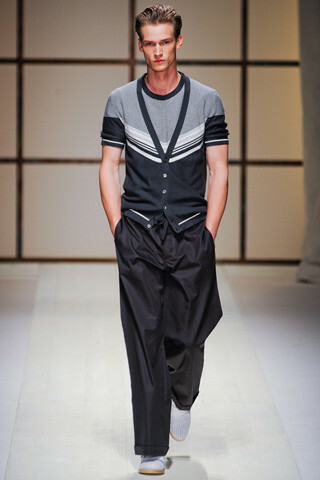 The cardigan (shown below by Burberry, John Richmond, Salvatore Ferragamo and Perry Ellis) has become a wardrobe staple that is essential for the layering look– can be worn casually and open or buttoned up for a smarter edge. You should own at least 2! Give your trusty cargo shorts a break and go for something a little slimmer. The key shorts for the season are worn above the knee and are a relatively slim fit. 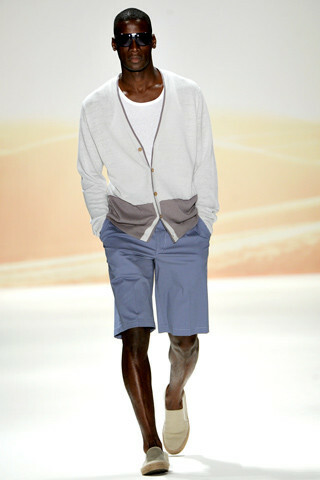 The shorts look great with a contrast colour blazer or worn casually with textured jumpers, cardigans or polo shirts. (Shown below by Perry Ellis, Rogan and J Crew). Spring also sees the introduction of a trend that has nautical and sporty influences and creates a pared down way of dressing. Statements are made through colour blocking and combine fresh and bright tones alongside stones and navy blues. 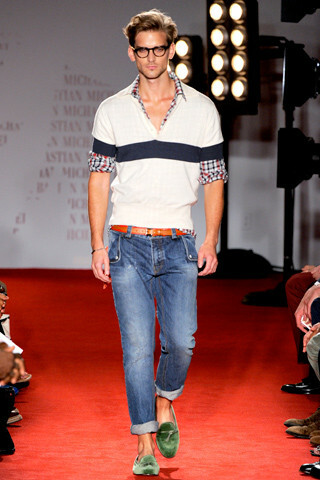 (Shown below by Missoni, Michael Bastian, Timo Weiland and Missoni again). Moving into summer add some brights to your wardrobe and wear colour in abundance - be as bold as you dare! Key pieces include striped tees and polo shirts, geometric graphic tees, bleached out chambray shirts, bright coloured chinos and chino shorts, short sleeve linen shirts and the coloured boat shoe or plimsoll. 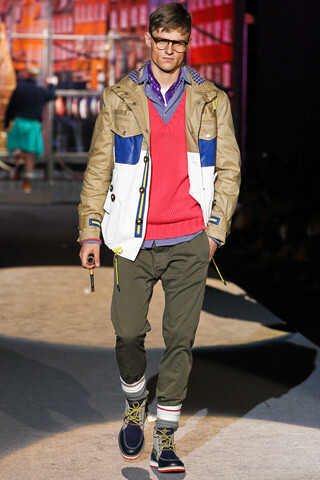 (Shown below by D Squared, Tommy Hilfiger, J Crew, D Squared and J Crew). An absolute must have item for the season is the tapered leg chino(shown below by DKNY, Paul Smith, Dolce & Gabanna and Michael Bastian). These can be worn rolled down for a smarter look or rolled up for a more casual laid back look. The safer colour is stone or grey but if you want to look a little more edgey go for a washed blue, green or rust colour. I hope this summary inspires you and gives you a focus when you're shopping. There's already some fabulous styles on the High Street - good luck and happy shopping! 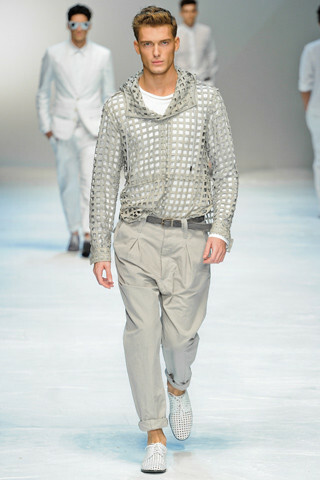 My next menswear blog will be 'Catwalk to High Street Suggestions' - watch this space! PS. I knew I shouldn't have thrown my school uniform away last year!